These Oleander half standards will make a stunning addition to your home or garden – adding height, vibrant colour and sweet fragrance all summer long. Covered in exotic pink flowers from May right through to September, these beauties have a unique twist – their leaves are edged with cream to create an eye-catching variegated effect! 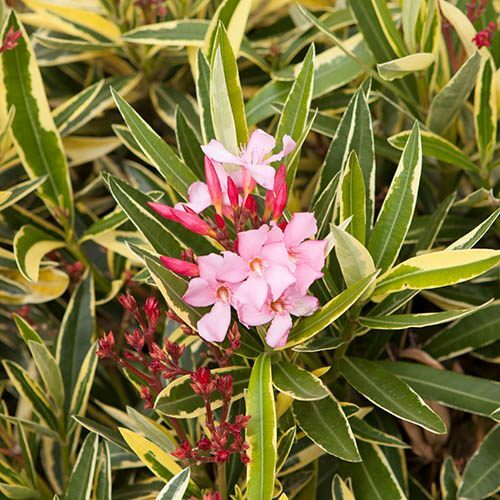 Standing out against other standard oleanders, the variegated leaves are fantastic for breaking up colours and adding foliage interest when flowers have faded. Remarkably they are perfectly happy in conditions down to -5°C and are very easy to grow and maintain – it’s no wonder they are so popular with UK gardeners! Supplied as a pair of trees, approx. 70cm tall in 17cm nursery pots. Club Price: £18.00 - Save: £2.00 Join Today! 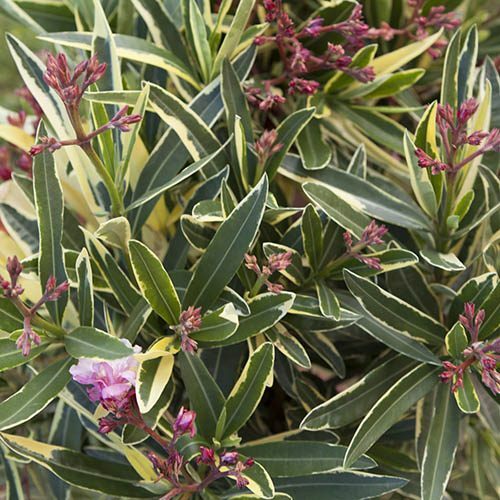 Standing out against other standard oleanders, this variegated variety adds something a little bit different to your Mediterranean flowering displays. Perfect for mixing up with other pure green leaved varieties, the variegated leaves are fantastic for breaking up colours and adding foliage interest when flowers have faded. Oleanders are drought resistant and simply love hot dry Mediterranean weather, yet they thrive in the UK too. Remarkably they are perfectly happy in conditions down to -5°C! Perfect for framing a door, they’ll look magnificent on your patio, borders, balcony, or even in your conservatory! These striking plants are very easy to grow and maintain – it’s no wonder they are so popular with UK gardeners! Supplied as approx. 70cm tall mature trees in 17cm nursery pots. Some plants may be in flower/bud, although this cannot be guaranteed.